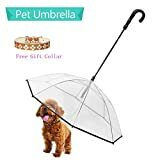 If it's raining cats and dogs, sleeting, or snowing hard enough outside for you to grab an umbrella while taking your furry best friend for a walk, then shouldn't they get some effective weather protection as well? 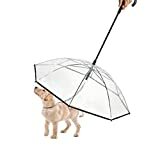 This cool new Pet Umbrella is a small umbrella designed just for dogs (cats too, but good luck with that) with a convenient handle for you that connects to a leash that attaches to your pet's collar or harness. 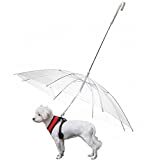 It features a waterproof transparent canopy to give you full view of your pet and is easy to open and close. 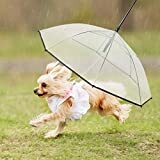 While, it might seem like you're over-pampering your pooch just a bit, just remember what it's like to live with a wet dog. Plus, it's kind of funny, especially to a cat.